Full-color photo cards include 12 month cards, 33 date cards, 7 week days, 4 birthdays, 2 field trips, and 2 special days. Also includes a 2-page activity guide. Product descriptionThis sturdy, vinyl pocket chart will makes a visually appealing introduction to weather. Includes pre-printed, double-sided cards for dates, days of the week, months, years, yesterday, today, tomorrow, holidays and celebrations, weather conditions and seasonsmdash;136 heavy-duty cards in all! Help students learn about the days of the week and months of the year with this engaging pocket chart. It includes 100 cards including days of the week, months of the year, calendar cover-ups, and holidays! Cards that fit into the pockets include month, date, year, day of the week, weather, seasons and special events. Birthday and special-event cards can be personalized with a dry-erase marker (not included). For added value, the backs of the cards are in Spanish. Three extra storage pockets at the bottom of the chart make for easy storage and access. 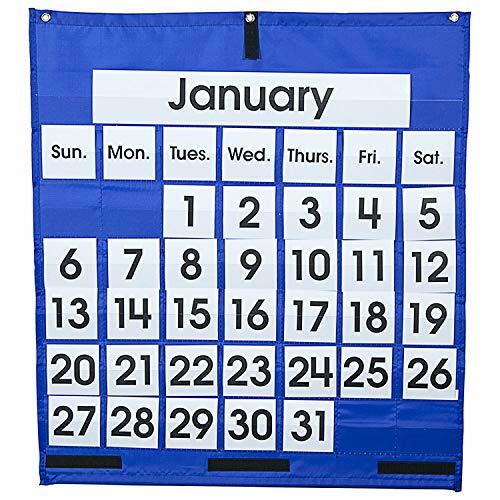 This fabric calendar has 50 clear plastic pockets in which to slide colorful cards for the days of the week, date, month, and special days. A fabulous way to start the day and help orient children time-wise. Three grommets make it easy to hang. 29 1/2". 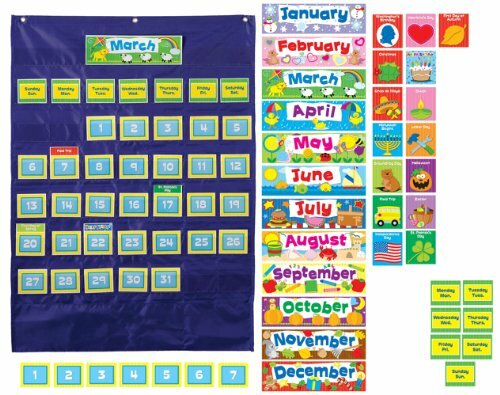 This versatile, easy-to-read monthly calendar is perfect for the classroom and serves as a great teaching tool for young students. Each chart includes seven columns and six rows for each day of the month. Also included are "Days of the Week" and "Month" cards that feature English with Spanish translations on the back. 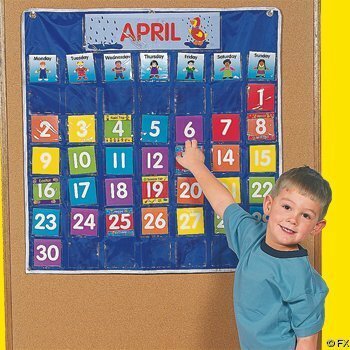 The Monthly Calendar Pocket Chart is the perfect companion to any early learning classroom. Its hands-on, interactive format makes it easy for students develop a better understanding of time and date relationships. It measures approx. 25" x 28. 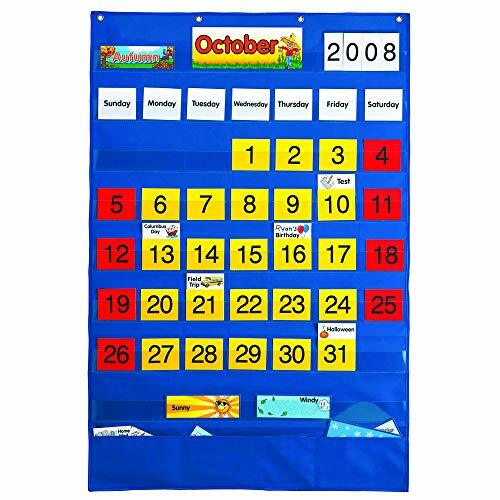 Durable nylon monthly calendar pocket chart with see-through pockets makes it easy to keep an organized calendar for your classroom. Complete kit comes with full-color month cards, day cards, date cards, four birthday cards and more. Fun images make it easy for students to follow along. 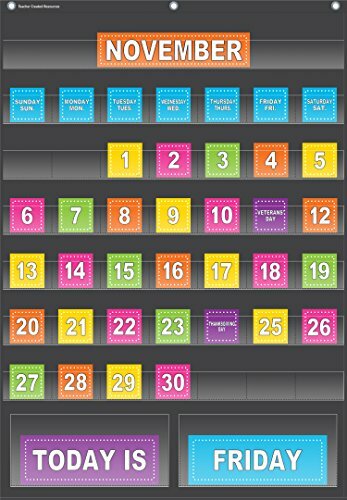 Use this convenient, do-it-yourself pocket chart calendar to mark all the special days in your students' lives, with two cards for field trips and two for special days. It also includes an activity guide. Students can create a class calendar each month for a better understanding of time, seasons. 43 pockets, plus cards for days of the week and dates. Flame-retardant; durable construction; sturdy grommets for easy hanging. Help students learn about the days of the week and months of the year with this engaging pocket chart. Chart includes 100 cards including days of the week, months of the year, calendar cover-ups and holidays. Pocket chart is designed for ages 4 through 11. Monthly chart offers a versatile, easy-to-read, unique monthly calendar for the classroom year-round. Seven columns and six rows provide a pocket for each day of the month. Chart includes English and Spanish month and day cards. Use included Hook-and-loop closures for attaching a weekly calendar (sold separately). 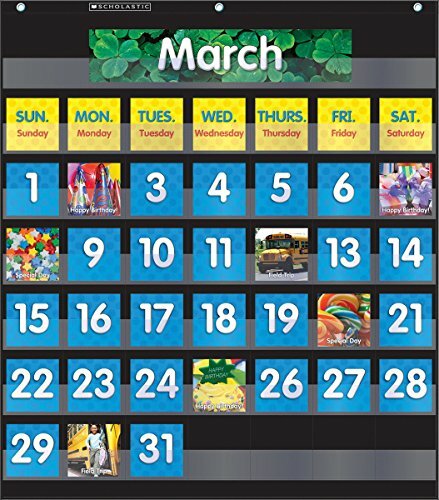 Attach month chart easily to the Pacon Weekly Calendar Pocket Chart. 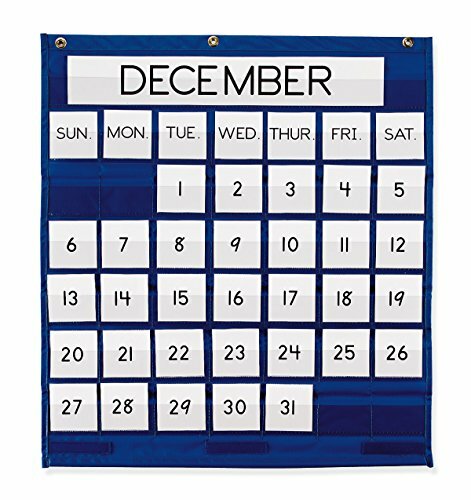 For use with your Monthly Calendar Pocket Chart. This set of 108 cards includes three sets of calendar date cards in Red, Green and Yellow (three inches by three inches), nine blank cards, three of each color (three inches by three inches). This pocket chart invites children to learn about seasonal changes, weather and holidays. 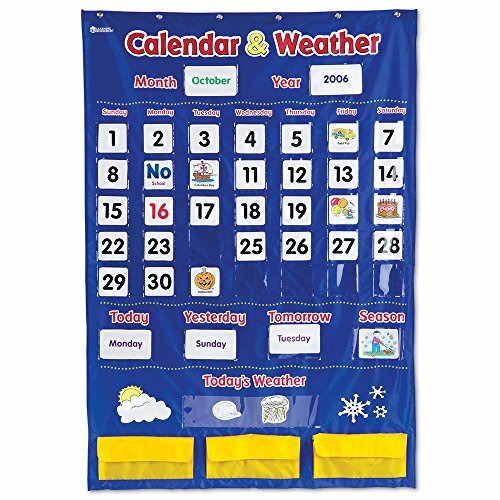 Weather-oriented calendar keeps track of daily events and helps to remind the class of upcoming events. 120 sturdy cards include numbers, days, months, holidays, celebrations, seasons and weather conditions. All cards include images and words for those children that aren't reading or are learning to read. The number cards are black-colored on one side and blue and red on the backside for odd and even number recognition. Storage pockets on the front provide convenient spaces to store all cards for an image-filled Calendar and Weather Pocket Chart. Cards feature English with Spanish translations on the back. Scholastic's Pocket Charts are essential tools for classroom teachers. They feature four-color realistic photography and come with a teaching guide with suggestions for multiple uses. Available now at your favorite teacher store!